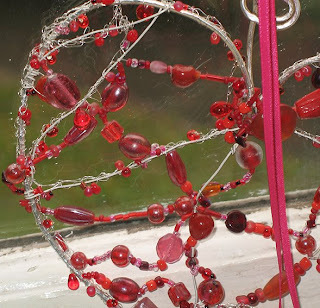 Here you can see the chain and beads in a bit more detail. The sea glass when I'd wrapped it up with those lovely vintage beadcaps and the little leaf bezels, reminded me of flowers and leaves, hence the garden. 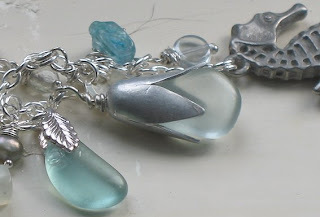 The sea glass is in three different shades of turquoise blue, starting with palest icy blue to almost teal blue. Here are some of my recent projects, including (ta-da!) 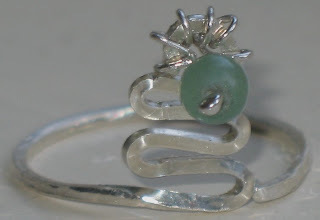 my first ever real, made-from-scratch ring! 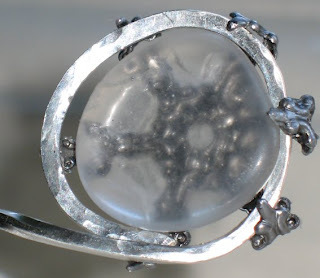 It's been made with thicker square wire that I bashed and hammered into shape with - obviously - a hammer, a mandrel, a steel block and the use of a pair of pliers. I then added a teeny aventurine bead at the top with the help of a ball ended head pin wrapped around the loop at the top. 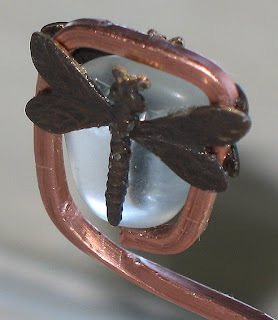 The ring is a standard UK size 'M' but is adjustable. It should be available in my Etsy.shop soon. All the wire is Sterling Silver. 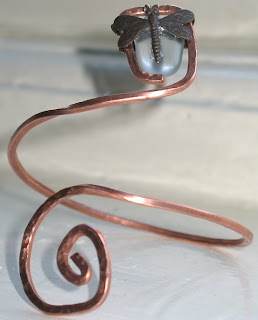 Here's my beautiful dragonfly bangle. Again it's been made with thicker square wire, bashed and squeezed and hammered into shape (took quite a bashing, believe me!) 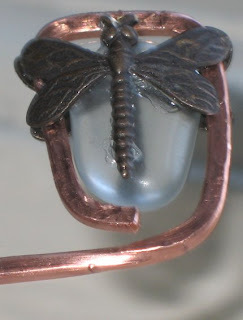 and then I added a sea glass nugget to the loop with the help of two tiny vintage dragonfly stampings. A generous spiral at the other end finishes it off. 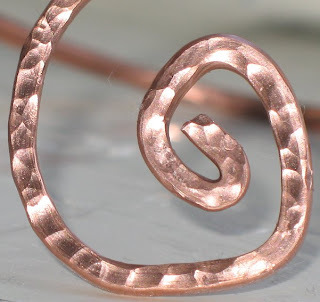 The wire is bare copper wire. Available in my Etsy shop soon! 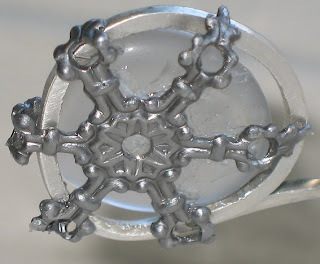 I've used a thick gauge of square sterling silver wire, bent, hammered and bashed into submission with various acoutrements, a sea glass nugget (go, say hello to Alison who braved the waves to collect it for me), and a lovely vintage beadcap/stamping in the shape of a snowflake. This will NOT be available in my Etsy shop, because I am going to wear it tonight. :-) However, feel free to commission one similar to this. 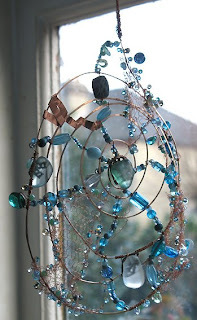 My latest fad is playing with lots of types of wire and art silver clay. 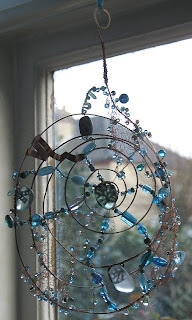 Some of the things I made with wire (using up lots of mixed up beads from previous projects plus new ones) were two sun catchers. I hope you can see the copper tape and the bits of pre-knitted copper wire and all the crochet! 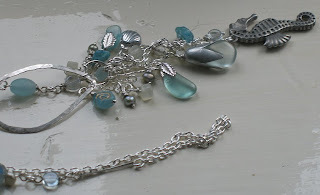 I've also used sea glass, which shimmers beautifully in the sun light. Number two is a present for a friend, which still needs wrapping!!! 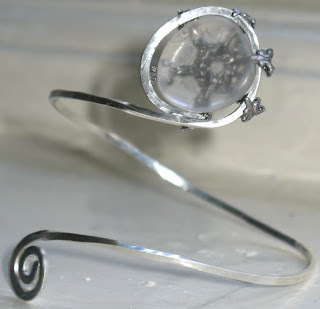 It's been made with hammered, silverplated copper wire, cream coloured craft wire and silver plated very, very thin wire. 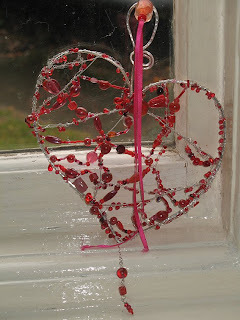 I've used millions of red beads, a bit of bending and wrapping and some crochet.